What do you do when you find yourself in a 90-minute session with a flock of around 700-800 Grandala’s and realise that you don’t have the right lens to capture a grander and bigger picture? After shooting a few portraits, for which I used a TC on my 600mm prime lens, I really wanted to capture the entire tree on which a part of the flock was perched. The issue was that all I had were a 11-16mm that was way too wide and a 300mm & 600m f/4 that were way too long. I realised that my travel partners were stuck on their longest lenses and borrowed a 24-70mm that wasn’t being used. But I wasn’t too happy with the results as the flock, by now, had moved to a different tree which was a bit further away. All this while, we were being given a lovely lesson on the behaviour of the flock. These birds always are found in large flocks – security in numbers helps protect them from raptors. They seem to fly in unison – just one of them taking off triggers a sequence of all the other birds following suit. 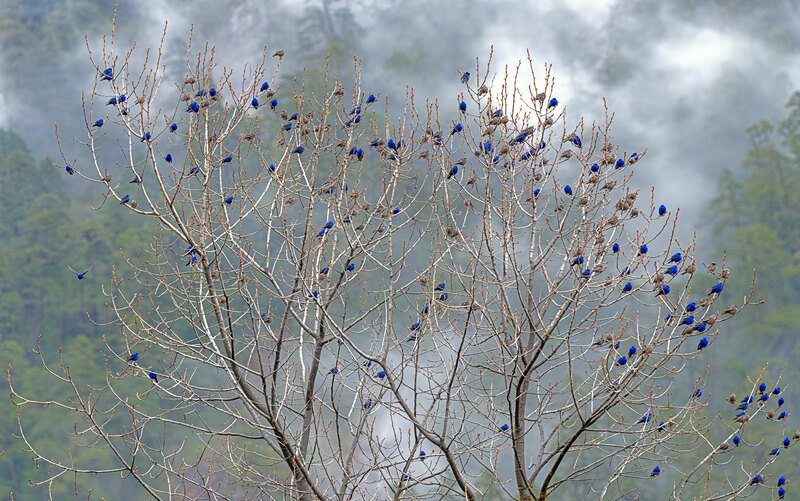 Once they take off, they would do a few circuits in the valley before they would invariably settle down on the same tree a few more times – a Grandala tree is quite a sight to behold and looks as if the tree is full of brilliant-blue flowers or fruits. The thought I had was to wait for one of these cycles till the birds have all perched themselves on the tree. Then, to mentally divide the entire tree into a 4×4 grid and click 16 images, with exactly the same exposure & focal plane across all of them, allowing for adequate overlap between the images. Doing this very quickly so that there is not much time elapsed between the 1st and the 16th image – too much time would mean that there would be some bird that may have shifted positions and that would cause blurring. If possible, meter the subject in advance. This would mean across the 4×4 grid and picking the most optimal exposure across all the frames. Switch to Manual and dial this exposure in (one can also use exposure lock to lock this down). Remember to switch from Continuous-High (C-H) or Continuous-Low (C-L) to Single shot (S) mode – one doesn’t want to waste time with the unnecessary extra exposures and sorting through them later in post-processing. Start at one corner of the 4×4 grid, keep a track of the frame so that you allow for adequate overlap on the adjacent frames, and quickly go through the 16 shots of the grid. While post-processing, open all the 16 images together on Photoshop and make exactly the same adjustments on the Raw image across all the 16 pictures. Still in the Camera Raw view, select all the 16 thumbnails in the filmstrip view and keeping them selected the mouse-click will open up the Merge options (HDR, Panorama or HDR Panorama). Select the Panorama option and let the PS algorithm do its work. Once it is complete, the Panorama Merge preview will open up. Adjust the Projection and Boundary Wrap, press Merge and you are done. You would never know how the final image will turn out till you get back and run through the processing steps. So, it would be prudent, if possible, to repeat the grid a couple of times just in case. While I have done stitched panoramas before, they have only been in the context of landscapes. This was my first time doing this on a wildlife / birding image and I am quite pleased with the results. There are 241 Grandala’s perched on the Sea Buckthorn tree with one just making its way into a perch. The mist / fog in the background adds an interesting feel to the frame – while completely messing around with the exposure! !